I live in a foodie town. I mean people here take food seriously. So seriously, in fact, that it’s often parodied in many-an-episode of Portlandia. Maybe a little too seriously…. The fact is, I could eat out for every meal of every day and probably not have one single forkful of food that isn’t tasty. Not one. Of course, I’d also be broke and not able to fit into my (one pair) of skinny jeans (because, really, who need two??). So, when I found myself craving Pad Thai, I decided to experiment with whipping some up at home. Admittedly it is a loose interpretation of the traditional Thai specialty. No tamarind or palm sugar hanging around in my pantry. What I did have was a jar of powdered peanut butter (and a can of coconut milk, also not typically used in a traditional recipe). Back to the powdered peanut butter. If you haven’t seen it, keep an eye out as it’s getting a bit easier to find in traditional grocers. It’s a pretty cool concept–remove all of the moisture (in the form of much of the fat) from peanuts and you have a peanutty powder that is ready to be used in many recipes including cookies, smoothies, cake frosting and yes, Pad Thai. And hello light and delish PB&J! The great thing is that 2 tablespoons have just 45 calories, under 2 grams of fat and 1 gram of sugar. Go to your cupboard and check the label of your regular, organic, all-peanut peanut butter. Shocking, right?! Bring on the Pad Thai! 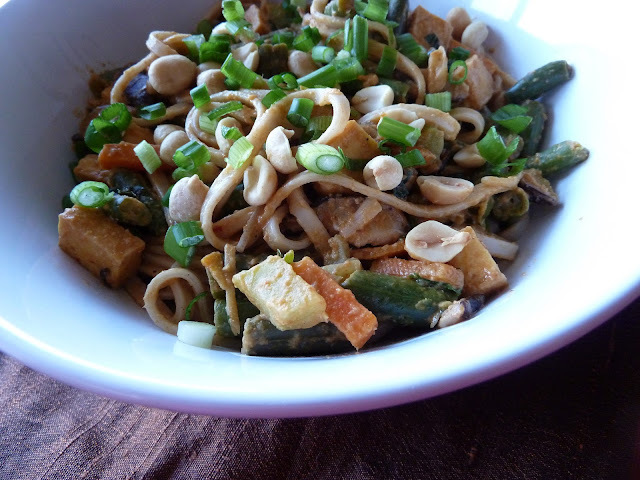 For this recipe I used gluten free rice noodles, you can use whatever Pad Thai noodle you prefer (you should be able to find them in the international section of your grocer). I also used a lot of veggies and went light on the noodles so everyone will get a generous portion without a lot of the calories the noodles typically provide in a dish like this (note, this is a great trick for many pasta and veggie dishes including primavera). Don’t be shy about substituting another protein if tofu isn’t your thing (chicken or shrimp would work nicely). This dish is pretty easy to whip up, looks beautiful, and makes a great main course if you’re having a get together with a few friends. 7. Turn off the heat and add the cilantro. Toss to combine.